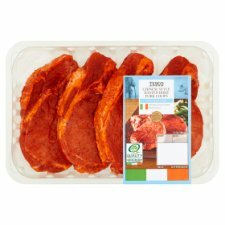 INGREDIENTS: Basted Pork Chops (95%)(Pork, Water, Dried Glucose Syrup, Stabilisers (Diphosphates, Triphosphates), Salt, Preservative (Sodium Acetates), Acidity Regulator (Sodium Citrate), Antioxidant (Sodium Ascorbate)), Chinese Style Glaze (5%)(Sugar, Salt, Maize Starch, Yeast Extract, Spices (Ground Star Anise, Ground Aniseed, Ground Fennel), Colours (Beetroot Red, Paprika Extract), Stabilisers (Xanthan Gum, Guar Gum), Tomato Powder, Garlic Powder, Modified Maize Starch, Onion Powder, Acidity Regulator (Citric Acid), Ginger Extract, Capsicum Extract). Place under a pre-heated medium grill for 22-25 minutes, turning occasionally. Allow to rest in a warm place for 5 minutes before serving.